This entry was posted on Friday, August 26th, 2016 at 3:55 pm. If you’re a horse person, then you’re familiar with Fergus, Jean Abernethy’s cartoon horse who embodies the “everyman’s horse” we’ve all known and loved. Fergus is silly, imperfect, and unpredictable, but he’s also adorable, charming, and a wonderful friend. The Essential Fergus takes a look at our favorite horse but also gives us a glimpse into Jean’s history. Jean, horse-obsessed since childhood, was not only always out in the fields playing with her ponies, but she also always had a pen or pencil in her hand. She was a natural artist even as a child. Throughout her years of studying horses and studying art, Fergus was born. Jean named him Fergus because she liked the idea of replacing the ‘u’ in his name with a horseshoe! This book was a fun and quick read. I enjoyed learning more about Jean Abernethy the artist, and of course, I loved reading some of my all-time favorite Fergus comics that are also included in the book. (My favorites are the ones with his armadillo friend)! 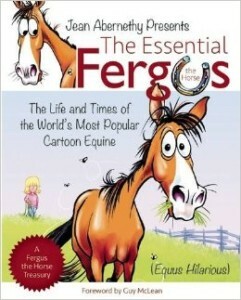 You can find Fergus for sale here – this book would make a perfect gift for your favorite horse buddy – or for yourself!